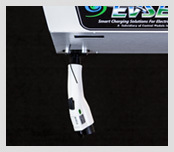 In addition to a diverse line of charging stations for electric vehicles, EVSE LLC provides tools and products that adapt to a variety of customer applications. From stand-alone charger station networks to custom integration into existing operations and systems, we’re ready to help you build your network of EV charging stations. 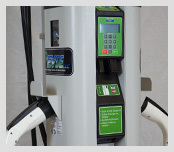 While we can integrate our charger station operations into almost any existing network, our payment modules and stations allow for stand-alone credit card payment/ID badge swipe to provide a direct revenue stream from your network of chargers. We have the tools to control EV charging station activation, transmit payment and even reserve space from any mobile device. 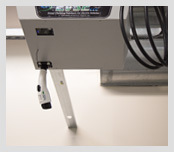 We can link our electric vehicle charging stations into your existing network and operations, or we can provide our own solutions for power usage monitoring, control charger operations and transmitting payment data. 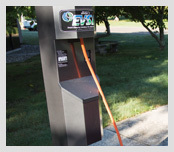 When not in use, the EV charger cable is automatically stored within the unit, protecting pedestrians from potential tripping injuries and preventing damage to equipment caused by weather, other vehicles and vandals.